by Jo Freeman, Ph.D., J.D. The recent front-page story in The New York Times accusing leaders of the Women's March of being anti-Semitic and associating with known anti-Semites rang a lot of bells in my head. I'm old enough to remember when the same strategy was used to attack the civil rights movement, especially but not exclusively in the South. Then the Bogeyman was Communism. Those who traversed the highway from Selma to Montgomery Alabama in 1965 were greeted by a billboard with a photo of Dr. Martin Luther King, Jr. sitting in a classroom. The caption read "Martin Luther King Jr. at Communist Training School." He was listening to a 1957 lecture at the Highlander Folk School in Tennessee. In the row in front, also visible in the photograph, sat the editor of the Harlem edition of the Communist Party newspaper, the Daily Worker. The photo was taken by an employee of the state of Georgia who had come to the workshop as press. Printed on postcards and published in newspapers, this photo became the centerpiece of subsequent denunciations of both Highlander and Dr. King. Mississippi Gov. 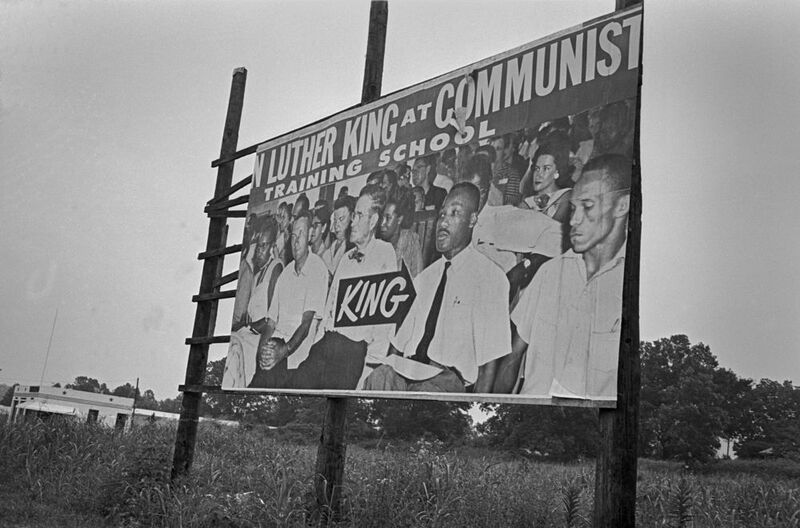 Ross Barnett held up an enlarged photo of Dr. King at the "Communist Training School" when he testified at hearings on the 1963 Civil Rights Bill. That photo was used again and again. This was neither the first nor the last time guilt by association was used to delegitimize the civil rights movement. Nor were these efforts aimed only at leaders. I got mine on August 18, 1966 when I was doing voter registration for Southern Christian Leadership Conference (SCLC) in Grenada, Mississippi. The Jackson Daily News devoted two-thirds of an editorial page to denouncing me. "Professional agitator hits all major trouble spots" headlined the editorial. The five photographs included one taken of me during the Berkeley Free Speech Movement in 1964. The editorial stopped short of actually calling me a Communist, settling for accusing me of working with Communists, having friends who were Communists and belonging to an organization for young Communists. Southerners regularly associated civil rights with Communism and the CP long before and long after the 1960s. They had a little help in this from the FBI and several "Un-American" Committees, both state and federal. The message was that if one (Communism) is bad, so must be the other. Opposition to this was complicated by the fact that there were some Communists in the civil rights movement. There were even more red-diaper babies (children of Communists), and members of other groups that had some of these among their members. Worse, the Communist Party supported civil rights and desegregation and had done so at least since the 1930s. I wasn't a Communist or a red-diaper baby, though some of the Berkeley student organizations I belonged to had some of each. Yet, even though I was only a foot-soldier in the civil rights movement I was tarred by that brush. My tarring was in turn used to smear the movement. Now those who don't like the #MeToo movement or the Women's March are using the same technique. Are there anti-Semites among the Women's Marchers at different levels? Probably. There are probably more anti-Semites in the country today than there were Communists in the 1960s. That has nothing to do with the issues raised by #MeToo or the Women's March. Now, as then, the press is making much ado about nothing much. Are we really as threatened by #MeToo and marching for women's rights as white Southerners were by the civil rights movement? Haven't we learned to talk about issues and not about people? Why is guilt by association still being used to attack social movements? As the anniversary of the Women's March and the federal holiday celebrating Dr. King both draw near, surely we've learned to do better in the last 60 years. Jo Freeman has published 11 books and hundreds of articles. The information in this piece comes from research for her current work-in-progress Tell It Like It Is: Living History in the Southern Civil Rights Movement, 1965-66. Citations to specific statements available on request.